Watch wildlife from a distance. Sit down and create a low profile. If animals notice you, or if they seem nervous, you are too close. Move away quietly. Use binoculars or a telephoto lens to get close views. 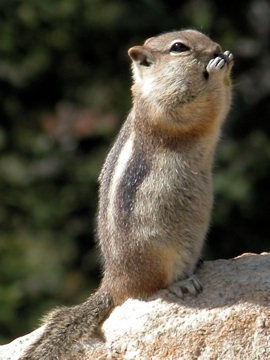 Feeding wildlife is illegal in all national parks. Feeding wildlife reduces its ability to survive the long mountain winter. When they panhandle by roadsides, animals fall easy prey to automobiles. As they become habituated to humans and lose their natural fear, the animals become aggressive and may be destroyed. Never approach wildlife. Harassing animals is unlawful. Keep pets in your vehicle. Pets may scare wildlife, and animals can hurt your pet. A deer can crush a dog’s skull with its hooves. Pets can also introduce diseases such as distemper. Drive slowly. Watch for animals crossing the road. Deer and elk are seldom alone: if you see one animal cross the road, look out for others that may follow it. Every year numerous animals are killed by autos. Stop your car to watch animals only if you can pull off the road safely. Do not block traffic. Talk quietly so you don’t disturb the animals or people nearby. If watching from your car, turn off the motor and headlights.